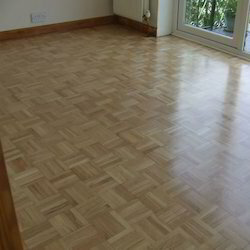 Manufacturer of Parquet Floor. Our product range also comprises of Indoor Sports Floor, Outdoor Sports Floor and Portable Sports Floors. Our offered Parquet Floor is highly appreciated for its solid construction that provides aged and a rustic appearance. This can be laid in a number of patterns like herringbone, basket weave, brick style and chevron. Additionally, the increased stability of engineered wood flooring is achieved by running each layer at a 90° angle to the layer above. This stability enables the product to be installed over all types of subfloors and can be used with under floor heating. On the other hand, Solid parquet wood flooring is the most traditional construction.